SACRAMENTO, CA – The Hispanic Association of Colleges and Universities (HACU) has released the following statement on the Governor’s 2018-19 State Budget Act. HACU is pleased that California’s $201 billion budget signed by Governor Brown last Wednesday includes significant higher education policy changes with a new funding formula for the California Community College (CCC) system and increased funds for enrollment growth across the segments. 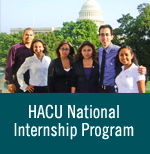 The CCC Student-Focused Funding Formula is a policy that HACU has been working on for the last few years and our advocacy efforts, along with those of other higher education advocacy organizations, led to the inclusion of the funding formula in the final budget. The funding formula will provide increased funding for those community colleges that serve large numbers of low-income and undocumented students to support these students in achieving a degree or certificate. Additional details about the funding formula are provided here. For Hispanic-Serving Institutions (HSIs) and Hispanic students, an increase in enrollment growth funds is crucial as many Latino/a students are being denied enrollment because our public universities lack capacity. The Budget Act provides $5 million to support an additional 500 students at the University of California (UC), and $120 million over four years to support an additional 3,641 students at the California State University (CSU). The UC also received $100 million to support efforts to improve instructional quality and bolster student services. The CSU received $75 million to support their Graduation Initiative efforts and $1.5 million to support student hunger programs. The CCC system received an increase of $523 million to implement the Student-Focused Funding Formula, $120 million to establish the online community college, $50 million to hire new full-time faculty, $50 million for compensation of part-time faculty office hours, $46 million to support the implementation of the California College Promise program, and $5 million to support currently and formerly incarcerated students. In student aid, the final budget provides $61 million to reflect an increase in Cal Grants, $4 million to increase Cal Grant eligibility for qualified foster youth, and $8 million to maintain Cal Grant awards for new students attending private nonprofit institutions with a requirement that the institutions increase the number of transfer students they enroll. Lastly, $21 million was provided to support access to legal services for undocumented and immigrant students attending the three public higher education systems.